In this podcast, Lindsay Masters, who is the events coordinator of Bainbridge Arts and Crafts (BAC), and Susan Jackson, who is the BAC executive director, discuss current and future exhibits at the gallery. Hailey Walker (Mosaic, 4th grader), Untitled, 2014. Watercolor, ink, collage. Gallery photo. 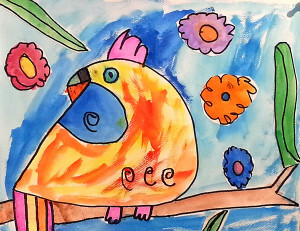 The gallery is now showcasing the works of local elementary students, which include ceramic creations, pencil drawings, paintings and colorful mobiles. On May 19th, BAC features art created by local high school students. That’s an annual event which the nonprofit gallery offers as part of its goal to bring art to the community. Karin Lowrie, Statuesque, 2013. Oil on canvas, 16 x 16. David Conklin photo. Sponsored by Bainbridge’s Heyday Farm, Karin’s drawings are all about chickens, cows and other familiar farm animals and farm scenes. For more information about the retail store and gallery, check BAC’s web site. 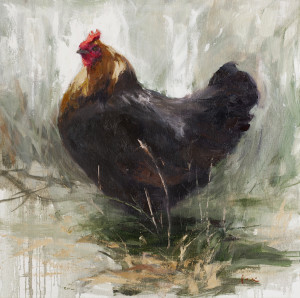 Bainbridge Island’s local Heyday Farm is sponsor of the Karin Lowrie exhibit at BAC.